I think I just might be a stress ball. I know you’re probably tired of hearing about my sleep patterns but I woke up at 3 this morning worried… about everything. The whole thing started when I got a notice about my student loans that are going to be due as soon I finish my grad degree. I’m getting my master’s in education and soon I’m going to have to do my student teaching. That means I’m going to have to work for free for a semester while I pay for daycare for Penelope. It’s not really the money that has got me stressed out (even though that will be expensive) it’s the separation that has got me all wound up. I have the luxury of staying home with her right now and I feel like I’m wasting this precious time by counting down the minutes to bedtime. I’m struggling with finding the balance at home. I don’t know what I’m going to do when I add a job to the mix. Then I start to think about Bridget and how she will be in sixth grade soon and before I know it she won’t want anything to do with me. In The Sun and The Moon I shared my story about how my mom died when I was in the third grade and as a kid I was never mad at her for what she did. I never felt sorry for myself or felt like I deserved any special attention. In fact I felt like such a weirdo when people tried to give it to me. As a kid you just deal with things without really thinking about it and carry on. It wasn’t until I held Bridget for the first time that I felt how significant that loss was. The dead of winter is always hard for me, I always kid around and say that I’m like a flower, I wilt in the winter and bloom in the summer. One particular winter two years ago I went into a tailspin. I couldn’t figure out why I was so sad. Then in the middle of the night I broke down and cried harder than I have ever cried in my life. Brent just held me while I writhed and sobbed. After I calmed down Brent and I were talking and it struck me that Bridget was in the exact same grade that I was in when my mother took her life. From a mother’s perspective that was hardly enough time to spend with your child. I couldn’t imagine Bridget ever having to go through what I did and it made me sad for the little girl who lost her mom twenty years earlier. I was mourning that little girl’s loss. It wasn’t until I talked to my Dad later that week that I realized that I had my meltdown on the 20th anniversary of her death. I didn’t even know the actual date of her death until then. It was secretly ingrained in me, that bond between mother and daughter unbroken after so many years. I have now officially been a mother longer than my mom was. Now, more than ever, I understand that my mom didn’t leave me because she didn’t love me. She left because she didn’t feel like she was good enough. What she didn’t know was that no mom feels like they’re good enough. We’ll always strive to be the best that we can be. But we won’t be perfect and we’ll always fall short of the ideal we have set in our head. That’s something we have to learn to accept and there will be many nights when we’ll stay up in the night worrying about it. 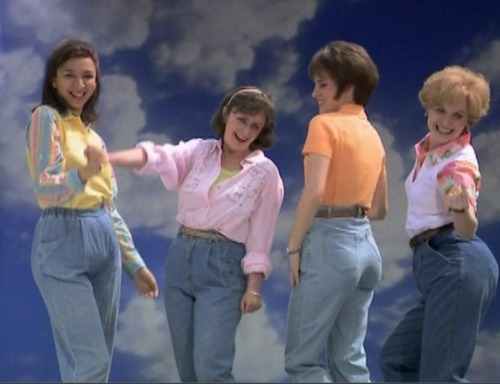 No wonder there is such a thing as “mom jeans”. I don’t think we can blame this phenomenon on the denim. I think it’s a side effect of the psychological stress of the mommy guilt that comes with motherhood. We pass it down from generation to generation like the Sisterhood of the Mommy Pants. Only they’re never flattering and they fit absolutely no one. But we keep on wearing them to cover up our stretch mark etched mommy pooches like a badge of honor. That is, until we loose enough baby weight to wear a designer pair. Thank you. It’s a long winter here and we’re couped up inside more hours than we are accustomed to so my daughter and I get a bit edgy these months. Heck, just today I asked my sister to borrow one of those little trampolines to incorporate some activity in our winter evenings. My dream for my daughter is that I’m a good enough mom. I needed this and appreciate you being so open and honest. This is a really well timed post. You’re speaking to the middle of me. I just keep wondering what I did to piss Mother Nature off and how I can make it up to her so we can go back to some HUMANE temperature above 15 degrees. This post was so very poignant and moving. Very well written. Thank you for sharing! Mom guilt is very real. And, such an everyday battle within me (and all mothers, I’m sure.) Loved this. Nina, I love you! My children are grown with children of their own and I still wonder if I was a “good” mother! Praying for you as you continue your journey and lose that weight! You are motivating me to get off that couch!